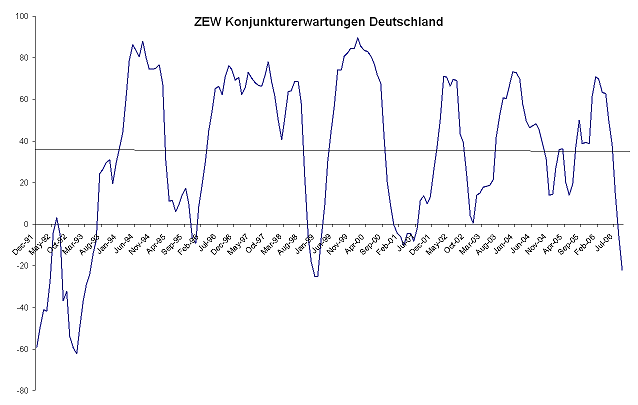 The German ZEW economic sentiment indicator posted a much worse than expected decline this morning (it is at -22 versus an expected reading of –9) to sit at its lowest level since January 1999. 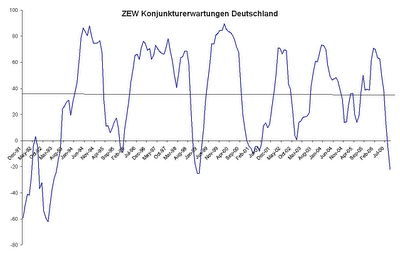 The survey behind this indicator is answered by a sample of German financiers. Its predictive value of German GDP and service activity is not helpful; but it is a solid, if volatile, indicator of German manufacturing activity 2 quarters out. If predictions of recession have not been posted here this year it is because there is so much of it about in the press generally and history shows it to be a guessing game. But for the record (and doubtless this is going to come back to bite) the model used here covering the United States flashed red on all fronts for the second quarter '07 on the basis of various August monthly data releases. The financial sector of Europe’s main economic engine also is now anticipating a US downturn from Q2 2007 and expects German export manufacturing to suffer as a consequence. How much this is a reflection of US expectations leading - falsely or otherwise - international expectations remains to be seen.